Why is a Flash Gordon figure here- on a GI Joe website? Because it’s pointless to ignore such a beautifully sculpted 1:18 scale figure that easily could have been used as a civilian back in early 80’s, that’s why! 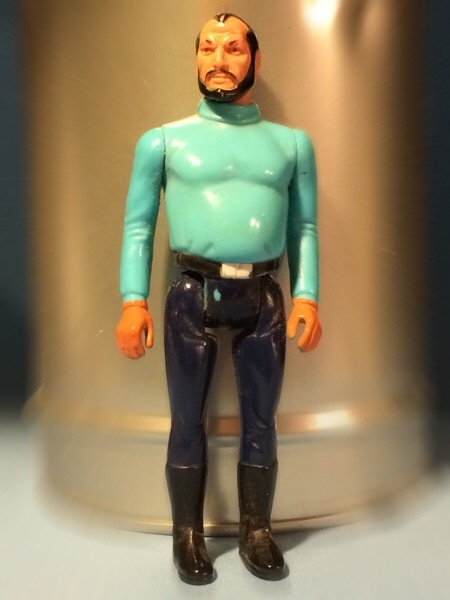 Introduced by Mattel in 1979, Dr. Zarkov is the only Flash Gordon figure which could pass as Joe-compatible, even with its modest five points of articulation. Look at the craft that went into this figure. That getting-on-in-years face, ignoring the beard and mustache, is a dead wringer for Mike Zeck’s drawings of The Punisher! Check out that hair- a receding hairline and a widow’s peak? Amazing. The sculpt work on the head is more lifelike than Kenner did for Star Wars, and honestly it’s even better than the early years of GI Joe ARAH. Dr. Z is a product of the late 70’s and he owns it. The understated swagger of Dr. Z screams “Midlife Crisis in the Age of Disco*”. Did his cocaine-fueled adventures involve nearsighted-women-with-daddy-issues? Yes. Did he own a bronze Oldsmobile Cutlass, which perpetually reeked of overpriced cologne? Yes. Did the music of Styx pound through his tattered soul? Yes. That’s a turtleneck hovering above what Dr. Z thinks are pecs, but we know they’ve already become early-onset manboobs. To round out the tacky sweater hat-trick is a paunchy gut, proudly enhanced by wearing clothing two sizes too small. Dr. Z, it’s time to go for XXL. He probably thinks that the shoulder work he does in the morning offsets the blossoming belly, but it doesn’t. Look closely and you’ll see that Dr. Z has a stylish black belt, but doesn’t take time for the belt loops. Belt loop usage is the mark of lower men. He doesn’t have the patience or the want. The belt, like Dr. Z himself, knows its job and doesn’t need training wheels. His no-fly, tight-in-the-crotch Sears slacks are simple enough, but he stuffs them into jackboots. That’s a power move. It’s the kind of confidence other men can only dream of. Even Flash Gordon. *this would be a great book title, wouldn’t it? I can’t believe you didn’t mention that he’s Destro’s #1 rival for the affections of the Baroness. Or at least, he thinks he is. Not the best likeness of Topol. Hilarious review, I want to be him.